StarBase 118 is the namesake of our organization, and was the first non-ship simming installation in the group. It still has one of the longest histories, but has been inactive since earlier this year. This week, we’re brushing-off the cobwebs and reopening this as an active sim site for the fleet, under the command of Commander Leo Handley-Page. Simmers on the starbase get to enjoy the best of both worlds: the intrigue, diplomacy, and expansive storytelling of a starbase, but also fast-response and adventure of a ship-based sim. 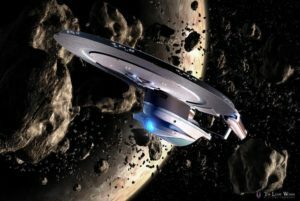 Just like Deep Space 9, our own StarBase 118 Ops has a ship the crew uses to leave the base: the USS Albion. This Excelsior-class ship is the perfect size for away missions, chasing down criminals, and meeting danger wherever it exists. When on the base, crew help manage the massive structure, its inhabitants, and the traffic in the Trinity-Serellan sector. Act quickly to submit your transfer request if you want to help relaunch Ops and be part of the ongoing legacy of this proud base as the roster of new ships usually fills-up within 48 hours of our first announcement going out. Want to learn more? Check out the StarBase 118 wiki page. Commander Handley-Page is also taking questions in the StarBase 118 Ops forum. Why should I transfer to StarBase 118 Ops? Lots of new opportunities for fresh stories, new friendships, and sometimes even the chance to move up to a new role like Department Chief (when available). You will help develop the tone and feel of the sim, while helping expand our overall community. Each new ship we launch helps us add more open slots around the fleet for new ensigns, ensuring that new members are more likely to get their first choice duty post. Meanwhile, it keeps the number of crew members down on each ship, so that each member gets more attention from the ship’s staff. These reasons make it more likely for new members to stay with the group long term, and therefore help us grow the fleet. What about my promotion status and awards? Your current captain will update Commander Handley-Page with your promotion progression and what kind of work you’ve done for your current ship. This will ensure that you’re still on the same time-line for a promotion as you were previously. The awards being given have been “set in stone” with the group staff. If your CO doesn’t present awards until after you’ve transferred, he or she will CC you on the presentation email. Either way, the awards you’ve been selected for will be yours, and you’ll be able to display them on your wiki profile. Please note that Counselor, Com/Ops, Diplomat, and Tactical positions are limited to one person. Your captain has already been brief about this launch, and you are encouraged to submit your transfer form if you’d like to play on StarBase 118 Ops. Our community staff are in agreement that help alleviate overcrowding on our ships is good for everyone, and no one will be barred from transferring. Simply fill out the form below with your contact information. We’ll add you to the list of potential crew for the launch and you’ll be notified later this week as to whether you’ve been accepted. Not everyone who submits this form will be able to transfer due to space considerations. Please note that we are not accepting secondaries or PNPCs at this time – primary character only.